The 2018 Goldwing offers ultimate touring luxury completely redesigned-the first in 17 years. A more fulfilling, superb riding experience to riders and passengers. The Goldwing’s frame has been redesigned, utilizing an aluminium twin tube configuration to allow for more flexibility and weight reduction. Die-cast aluminium parts are fully used for the frame body. The riding position for both the rider and passenger have been moved toward the front and the seat rail has been shortened. To achieve ‘excellent dynamic performance and comfort with an enhanced controllability in a wide variety of situations,’ the Goldwing now adopts a newly developed front double wishbone suspension system. The cushion functions for absorbing shock and the fork holder responsible for steering are separated from each other. The shock transmitted from the road surface to the handlebars has been reduced by about 30% compared to the previous model, resulting in a much smoother ride. A new attaching method of the swing arm to the frame results in weight reduction of 2kg and increased stability. Adopted for the rear suspension is a manually adjustable preload system, coupled with Honda’s Pro-Link system to ensure a comfortable ride. 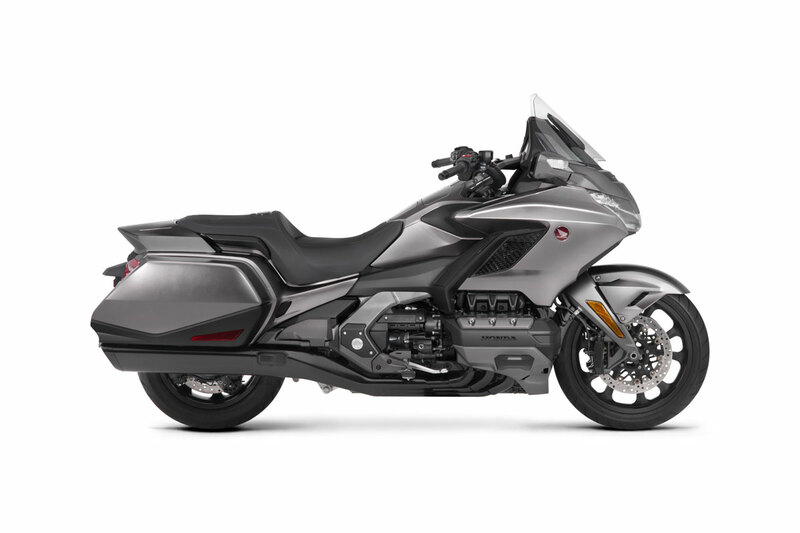 For the new Goldwing, electronically controlled dual combined ABS optimally distributes braking force to the front and rear wheels, in linkage with the current Riding Mode of choice, automatically adjusting the braking characteristics more in line with the riding situation, which has enhanced the sense of security in riding. The newly designed engine utilizes Unicam technology with a compact 4-valve cylinder head resulting in a lightweight package and as a first for the Goldwing, a Throttle-By-Wire (TBW) system has been adopted. The selectable Riding Mode system better accommodates different riding conditions and the new position of the engine allows for extra space for the rider’s feet. Other wide-ranging measures that helped achieve weight reduction include the use of aluminium cylinder sleeves, a change made in the camshaft material and a revision of the cooling water routes. A new third-generation 7-speed Dual Clutch Transmission (DCT) has been developed and utilizes a reverse chain to assist with the reverse function, adding to the units’ overall compactness and lightweight feel. The Walking Mode, forward and backward movement functions are operable with a hand switch. Other changes include a new exhaust system, ISG (Integrated Starter Generator system), Throttle-By-Wire (TBW) system, selectable Riding Modes and torque control. 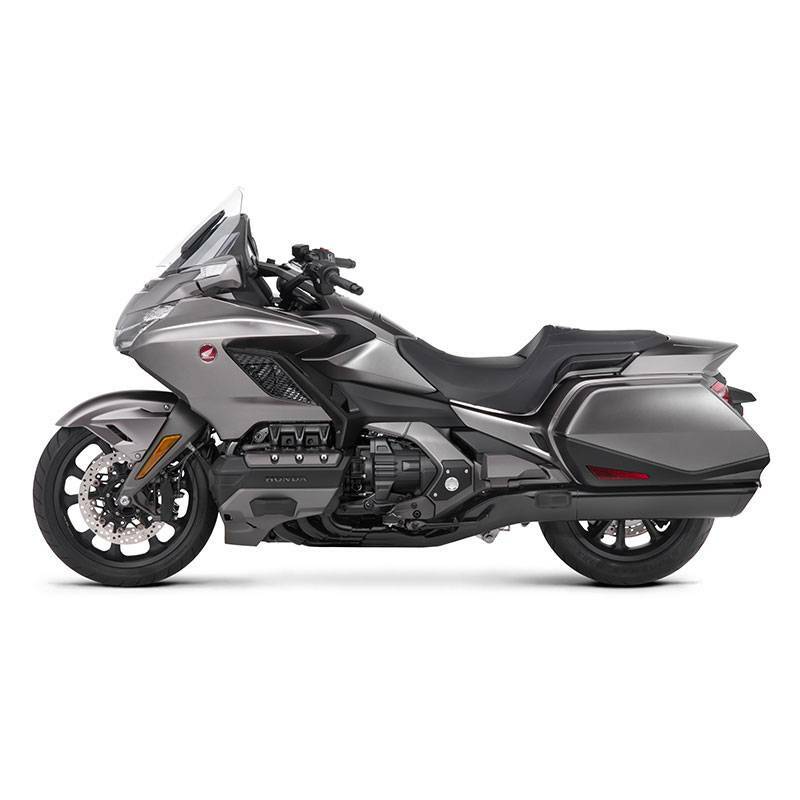 The new Goldwing has hill start assist and cruise control, ideal for long-range highway cruising. For the first time in a large motorcycle, Honda has adopted both an Idling stop system and an ISG (Integrated Starter Generator.) The Idling stop system provides excellent fuel economy whilst the ISG integrates the starter motor and generator functions into one compact unit for further weight reduction and mass centralisation. With the following smart systems now installed, the 2018 Goldwing has become more convenient and easier to use. The smart systems are activated by the exclusively designed smart key and include: System for tuning ON or OFF the ignition. It has now become possible to turn ON or OFF the ignition and lock the handlebars while just carrying the smart key. It is possible to open and close the saddlebags without the hassle of actual key operation, as long as the customer carries the smart key with them. Vehicle finder system where pushing and holding the Call button of the smart key results in the hazard lamp flashing. The Emergency Stop Signal system (ESS) assumes the function of promptly warning the following vehicles of sudden heavy braking by automatically activating the hazard lights. High-grade textures, 7-inch full-colour TFT liquid crystal display screen and its three-dimensional design, offer a cockpit view with both a luxurious feel and cutting-edge characteristics, worthy of the flagship model’s cockpit. With the addition of the tyre pressure monitoring system, a warning light is displayed only when tyre pressure is low. As well as offering the latest technologies and features for the audio systems, the new Goldwing offers the Apple Car-Play system enabling access to wide-ranging information. Launched as the GL1000 in 1975 its horizontally opposed four-cylinder engine was not only physically different, it felt very different with a silky output perfect for long days in the saddle. A six-cylinder, 1500cc overhaul in 1987 saw the Goldwing once again state its intent and purpose to benchmark the ultimate touring machine. The core appeal of the Goldwing remains its unique ability to make long-distance travel a truly rewarding and enjoyable experience. 43 years of development have lead to the new-generation Goldwing Series, 'the Premium Tourer' drastically renovated to offer a more superb riding experience for rider and passenger.